Lines can be either calculated using the Bresenham's algorithm, but also by using precalculated slopes. When the lines being used are all short, the number of needed slopes is rather low and memory consumption is less than one might expect. There's also other ways of building lines, like with precalculated tiles or such. Note: To start your compiled line.prg, type SYS 14336 (= $3800). Program doesn't start automatically. The versions for decrementing/incrementing x only differ in the x handling, so after all we have two algorithms that we use, one specialized on steep slopes and one for the flat slopes. So for steep slopes we always take one y step per pixel, but when our error value overflows we take also a step in x direction. For that we use a mask to cover 8 x steps. So a stepping for e.g. one pixel to the right is just a shift on the mask with lsr mask. The good thing is, when the pixel falls out on the right side, the carry will be set, and thus we know when we bump on the end of our column that we draw in, no matter if we draw on a hires screen or a 16×16 charset grid. In that case we have to do further steps, like adjusting the target where we write the pixels to, as well as resetting the mask to $80 in that case. First, we split up the line into full columns that it covers, the end chunk needs some extra handling. Now we take one column by another to be drawn over. If we start with the leftmost pixel in a column, we start with a mask value of $ff. We keep that mask until we either do a step in y-direction or leave the column. If we leave the column without having had a y-step, we write out $ff and have indeed set 8 pixels with one write. If we have a y change after say 4 pixels, we take the mask, and do a and #$f0 on it and write through 4 pixels. Sounds complex, but as soon as we unroll the code and handle 8 pixels by such an unrolled loop, the initial mask values and values for the and operation are fix. Now seeing that kind of pixel collection one might even go one step further. Actually we can maximum draw 8 pixels until we bump upon a columnchange. That means we can only have 8+7+6+5+4+3+2+1 = 36 different patterns, so why not working out all permutations in code and by that even save on that masking stuff? jmp f8_new_column+2   ;nothing to ora, as all pixels will be set anyway! Examples for the steep slopes can be found here. Also one can unroll things in the same manner as for the flat slopes regarding permutations, just that we aim for different run lengths and not for patterns. Needless to say that this code is best placed into zeropage for maximum performance. The addition of dy and the next upcoming subtract can again be aggregated and additional cycles can be saved that way. Unrolling the above code brings two advantages: One does not have to check for the underrun of Y, and one can use absolute adressing. The tradeoff: sbx can't be used anymore and one needs to use sbc dx/adc dy to calculate the slope, what wastes more cycles. Also one needs to find the sweet spot between saved cycles and memory consumption. Memory consumption is 2176 bytes (17 bytes * 8 pixels * 16 columns). However this method forces us to do an extra handling for the last x-position on each line, to land on the right Y value. bcs ++             ;ossom 18 cycles per pixel! This method would work on inverted graphics, means it does not plot but delete pixels, thus we can make use of the SAX command, but for that have to get rid of the y-index. However memory consumption is tremendous now: 24 * 16 * 128 = $c000 bytes. However there's a lot of dead code there. 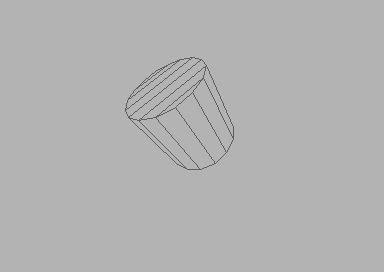 Especially at the outer columns there's no need to unroll all 128 lines, as you object will rotate and draw within a circle, it is enough to only support those bytes that are within that circle, no lines will be drawn outside of it. So it would be around 4 / PI * $c000 bytes. Now you can unroll the loop for 16 (or better 8, if you choose to cover 2 rows by using Y & $7f or Y | $80) rows of chars and handle 8 lines per charline continously. Also the code needs to be unrolled per X shift. Whenever the pixelmask wraps around, one needs to subtract another 8 from Y, not too much of a compelx handling, but therefore with somewhat 20 cycles for setting a pixel. The flat version will therefore need some etxtra handling on changing a charrow, but as that is happening rather seldom it should not matter much. bcc +         ;all done, or is another single one needed? As you can see, we can aggregate the subtractions already beforehand and plot the next and last chunk within this column. To some amount the runlength slice paradigm could also be applied to certain parts of the steep slopes. Imagine you calculate the lines within blocks of 8×8 pixels. On steep slopes thus, maximum 8 x steps can occur during 8 y steps. Thus, when our slope once leaves the current column to the left or right, on the next column one can forgo on the column checks, as the column will not be changed once more until the upper or lower border of the block is reached. Splitting things up into a big bunch of algorithms sometimes look like a good idea as each algorithm can then be maxed out. But on the other hand all the decisions have to be done for each single line, and easily consume the few saved cycles of a special case that only happens each now and then. It is wise to keep track of the optimization one does by benchmarking each new try. Thus it is easy to decide if a change is wort the few cycles for lots of additional code, or if the changes even slow things down. Luckily, there's also a bunch of good solutions to all those bothers! As for x-coordinates, lines usually do not get that big lengths if you keep your model fairly complex, if it would really happen, just cut the line into two halves and draw 2 shorter lines. This however only applies to dx/dy, x-coordinates still need to be handled with 9 bits on a 320×200 screen. But the hassle with those is less than expected, you'll see! As for the other two problems we can take advantage of the fact, that we use a screen together with a bitmap. When ink and paper on screen are set with the background color, the corresponding block of the bitmap is made “invisible”, as both background and drawn content are displayed in the same color. So clearing can be done by just writing for e.g. $00 to the whole screen to camouflage the bitmap content. When drawing lines we would however need to also set the screen to make our blocks appear again. Cumbersome on the one hand, but also a cool thing, as we have by that a map of dirty blocks, on which we can do further optimizations. So what we do is walking relatively on a screen and bitmap, for that we use 2 pointers. One for the screen and one for the bitmap. For each direction the pointers are manipulated respectively. Also we would now be able to give each line a different colour (but of course would need to avoid clashes). Thus, when we leave a block and enter a new block, we can now make decisions while consulting our map. If we enter a used block, we will need to merge in our new content the classic way (by using ora), but if we are on a pristine block, we can simply write through our new pixels without the need of ora. However we need to wipe out the lines of the block that we don't use, as they might contain garbage from older renderings, that would become visible on “turning on” that char in the map. Now we could even go a step further and move that concept of a map over to charmode (see image with visualized screen that represents the final image). Here we have an easier handling as on every new block that we start just need to advance the charset pointer by 8. Also we would just need a forth of the space a regular bitmap would consume. However we are limited to 256 chars only, but to reach that margin you need very huge and complex objects. The objects in Comaland use a maximum of 192 chars, so that there are another 63 chars left for the logo and a clear char can be reserved. Of course you are also free to work with several charsets and split the screen vertically. But then even more complexity applies. Better start with a single charset first. So how would all this work? First, we take an empty charset and define char $00 as an empty char, we fill the screen with $00 and wipe out the first 8 bytes of our charset. Thus we start with an empty srceen. Now we draw the first line, render it block by block (dx / 8 and dy / 8). Due to that, a lot of optimizations like run length encoding can be applied, in x- and now even in y-direction! (more on that later) Whenever we leave a block, we decide on how to render the next block and what area we need to clear. If we move from a pristine block to another pristine block, we can best case clear 8 lines in a row (in 50% of the cases this can be optimized to 8 bytes being cleared linearly!). On leaving a pristine block, we also place the current char number on the screen, then we advance the char pointer and the char number to be used. The screen pointer will be bumped in any case to be able to access teh next block info, as the screen also acts as map for used blocks. Sounds complex but actually the following code snippets look rather simple, right? Draw 2 pixels in one go until we leave the block either at the top or right side. Upon leaving we recognize due to the position in our unrolled code that we rendered until y = 3, so there's 3 lines below to clear, upon entering the next block we recognize by the position in our unrolled code that we start with y = 3, means we have to clear the 5 lines to the bottom of the block. As it is a pristine block, we can continue with write through mode and forgo on using ora. Upon entering a dirty block that is already in use, we switch to ora mode. For that we pick the screen code and multiply it by 8 (+offset) to have the resulting pointer into the charset, a lookup table makes things easier and faster. So we can in the next step at least expect 3 pixels in a row, no matter if we follow the upper example where 4 pixels would be our minimum or the lower example where 4 pixels would be our maximum. The said optimizations are only available in the write through mode and not if the new content needs to be ora'd in. As described, clearing can be done by simply wiping out the used screen. There's also the option to wipe out the charset until the last used char on each frame and forgo on the clearing per block. In practice it showed that the clearing on a block basis however performs already pretty fast. In case one would need unrolled code that is entered at the right offset, what will be quite costly with double buffering. For a faster clearing of the srceen one can log the screen per frame and thus build up a map of overall used blocks during the whole effect. Unused blocks do not need to be cleared over all. 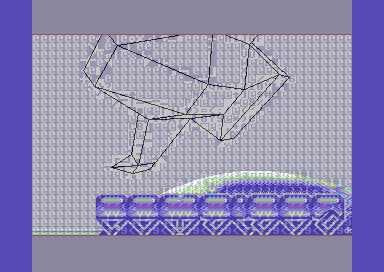 This makes the resulting speedcode faster and smaller and allows for clipped overlayed objects like the logo.